A person … whom I can’t recall … informed me of the place we’d come to. I often find torn pieces of paper from dinner check presenters or ripped out of my Moleskin notebooks. On one I had written the address of a Honduran restaurant that I needed to try. I might have been talking about Honduran baleadas and that spawned that exchange. Whoever you are… Thanks! So my wife, Janet and I made our way over to Little Havana’s side streets to see what it could be we needed to learn of Honduran food we have missed so far. Probably a lot! 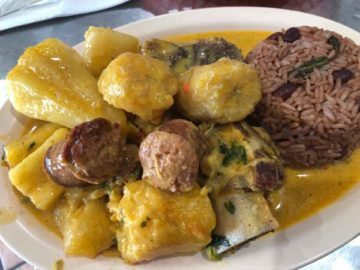 After all … Honduran food is a fusion of African, Spanish, and indigenous cuisine. I’ve read that Honduras uses more coconut than any other Central American gastronomy. We entered the tiny spot on S.W. 8th Avenue. It was a good kind of noisy. Not the blare of forced music nor the hideous overuse of television sets in restaurants. Something outside of sports bars I will not abide! It was the happy soundtrack of local people tucking into some authentic, home cooking. The set up is kind of cafeteria … admittedly not the kind of place Instagram folks typically adore. But flavor doesn’t have to be pretty. I asked our sunny server for a bowl of Mondongo. Alas the tripe soup/stew was not available. I asked if she had a favorite dish. This seemed to surprise her. I am used to the surprise. It isn’t so often that a person looking like me speaking Spanish awkwardly asks for the wisdom of others. We all should. She said, “Tapado”. I was … unfamiliar. Later I learned that it is often a seafood dish. What I saw in the steam table was decidedly a meat centric version with rib bones sticking out of short intervals of braised beef. Some sausages kept company in a nice looking gravy. There was some Gallo Pinto alongside. That dish of beans and rice is justly adored in many countries. I set aside my confusion after my research showing most tapados being seafood varieties and look forward to more clarity on this dish from a knowledgeable native of Honduras. As we waited for the dish I noted two items on the table that allowed for some flavor adjusting. They were not ketchup and mustard but a somewhat thick hot sauce that meant business and also a clearly homemade Salsa Picante that was a bright pink in color. I tasted each and knew I’d be augmenting my lunch soon with both. The dish arrived piping hot. Yuca, plantains and a side of tortillas arrived too. The tortillas were small, clearly home made and hot off a well used griddle. I tore one up and pushed it down into the juices of this meaty tapado. I was able to then sop up the goodness that pooled under the mixture and my morning hunger pangs were quelled. I looked about the place. Families were arriving. I smiled to see our young server giving a quick massage to the older woman washing the heavy pots and pans. A delivery man came in. He was familiar to them. He carried two large, see through plastic bags of a reddish-brown substance. I was guessing perhaps it was mole. But not knowing … I asked. She was now comfortable with my ways and said, “Achiote”… but that is another word on food. I’m Norman Van Aken and that’s my Word on Food ©.